SUPERCAR PERFORMANCE SETS THE PACE… From left, Darryl Twitt Motors marketing manager, Pike Peters and Shepparton Jaguar sales manager, Toby Balfour are excited to take for a spin in this exciting new electric Jaguar I-PACE. Photo: Katelyn Morse. THE acclaimed Jaguar I-PACE glides silently but with purpose from the soon to be opened service centre at Shepparton Jaguar Land Rover, having charged for just over an hour. The range shows at 470km, enough to get to Melbourne and back comfortably. 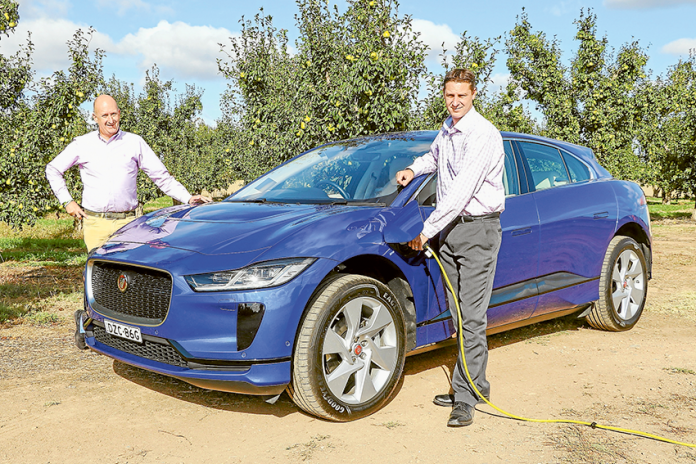 The Jaguar I-PACE is the first luxury battery electric vehicle to be supported by an established dealer network, including here in Shepparton. 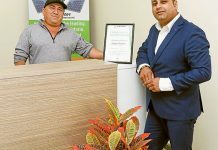 One hallmark of the new service centre is that they offer both a 50kW DC charger, similar to public infrastructure, as well as a 7kW AC charger, identical to home solutions, giving 35km charge per hour, or a full charge overnight. The I-PACE offers supercar performance; 4.8 seconds to 100km/h with 294kW of power and 696Nm of torque. Technology and unique cab forward styling make this Jaguar a very elegant and special place to spend time behind the wheel and as a passenger with exquisite materials, like the Touch Pro Duo infotainment system. The I-PACE is available for test-drives by appointment this week at Shepparton Jaguar Land Rover. The Adviser team will be having a drive and we will share our experience in the Jaguar I-PACE soon. Bookings can be taken over the phone by calling Shepparton Jaguar Land Rover on 5822 5885 or by visiting their Facebook page at SheppartonJaguarLandRover. Egg-stravaganza back by popular demand!